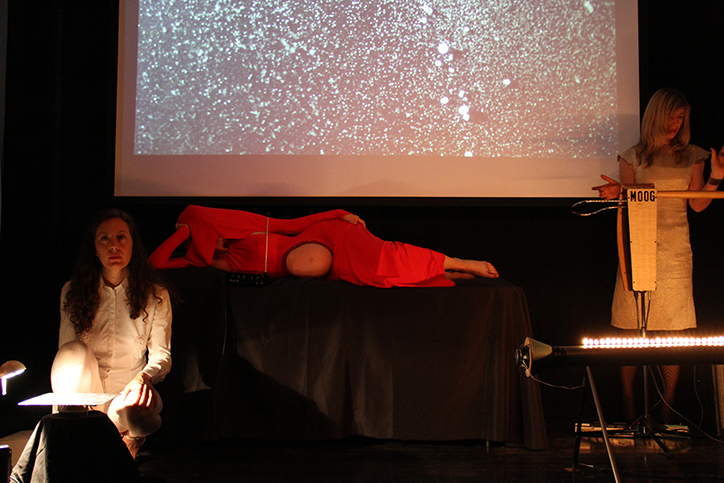 Ventriloqua was a performance at Cabinet created by Aura Satz and featuring Dorit Chrysler. I participated as an instrument, a body nothing less, nothing more. I was about 7 months pregnant: "Ventroliqua," a duet in which Aura Satz, playing the electromagnetic waves of a pregnant body is joined by Dorit Chrysler on the theremin. Referencing ventriloquism in its literal sense of “belly speaking,” the performance turns the pregnant body into a musical instrument, an antenna, and a medium through which a pre-verbal, pre-vocal otherworldly voice is transmitted. Chrysler’s theremin will create spectacular wave flames as its music triggers the flame alphabet of a Rubens’ tube, while a Chladni plate will turn the acoustics into the uncodified language of sound figures.